Radio silence due to scrambling to get the rest of the paperbacks done. Delays! Due to the fact that The Outskirter’s Secret is significantly longer than The Steerswoman. Thought I could use the same format, and just paste in the different text and cover, but nope. Had to move to a larger size. Requiring lots of other adjustments. And errors. And fixes. And more adjustments. And now I am behind schedule, and so must scramble. Ah, remember the good ol’ days when I was traditionally published (by Random House/Ballantine/Del Rey)? They had people to do all this! Oh, right. The books went out of print. That’s why it’s all in my hands now. Well, y0u know, I actually do enjoy it. I’m arty, I’m nerdy, I’m tech-savvy — this taps my other skills. And when the current story itself is being recalcitrant, at least here’s a task that succumbs to dogged determination. But if I want them available by Christmas, I’d better get going! 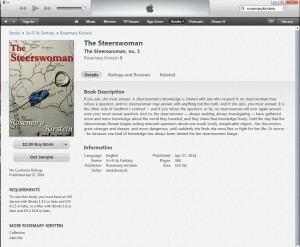 Today I seem to be too busy to a) blog, or b) reset the sale price on The Steerswoman. 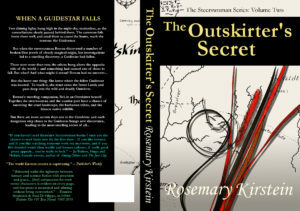 But that’s not bad, because b) the sale is still on, and a) how about an out-take from The Outskirter’s Secret? The readers who follow my blog saw this a couple of years ago… but if you’re new, it’s new to you! It was taken out of the final version, because… well, it wasn’t actually needed, and it did not help the pacing. And the book was already long. All good reasons to cut it loose. But still: I find it fun. So, here it is (again). All for the best. Really, it did the chapter’s pacing no favors. But if you’re curious about the Outskirts’ insects… there you go. No, don’t click on it — I can’t link you to an iBooks entry! You’ll have to go there yourself. Now, I know for a fact that the ebook has also been sent to Kobo, Barnes & Noble, Scribd, Baker & Taylor Blio, and Flipkart (that’s in India — I’ve already sold in India via Amazon, by the way) among others. However, it hasn’t shown up on their websites yet… So it could be a case of Real Soon Now, depending on the individual websites. How do I know this? Well, for everything not-Amazon, I’m using Smashwords as my distributor, and they do have some nice tracking, so I can see which online stores have been sent the ebook. But so far, only iBooks actually has the book on sale. So, if you’ve been waiting for this, check your favorite ebook source, to see if it’s up yet — if it’s not, it will be, soon! Be warned that there are TONS of spoilers. Ack! Must run now. I am suddenly in a time-crunch. This because they’ve set the date for my surgery as May 9, just over a week away, and now I must accomplish everything that needs to be done before that in that short span of time. ADDED INFO I FORGOT: Hey you can get it in every format, right now, from Smashwords themselves!